Warmer days, cooler nights — it’s “pothole growing season” in Missouri! As the road surfaces freeze and thaw due to moisture, cracks in the road start growing into potholes. Those pesky potholes cause more trouble than you might think! The AAA auto club estimates a mind-blowing 3 billion dollars yearly is spent in the U.S. on car repairs due to potholes. When you think of auto repairs due to potholes, your first thought might be tire damage. True enough! In fact, reputable tire and auto centers offer “road hazard warranties” with purchase of their tires. Considering the price of tires, this may be a worthwhile investment. Most of these warranties only cover you for one year. Like me, you probably hope to get more than a year out of your tires! However, your car repairs could escalate into even more expensive damage. Consider that the 2016 AAA survey found more than 30 million Americans forked out between $250 to $1,000 dollars for pothole damage to their vehicles. Why? That jarring drive over potholes easily messes up your car’s suspension system: shocks, struts, and even ball joints. And what about the front-end alignment you paid for with your new tires? Even more costly than an expensive auto repair is an expensive a pothole-induced auto accident. Say you swerve suddenly to miss a pothole, and you hit a car in your blind spot! Or perhaps you brake quickly to avoid tearing up your catalytic convertor in your car’s undercarriage. Suddenly you risk becoming the victim of a rear-end auto accident! Both drivers lose time and money to the lowly pothole yet again. Even worse, that hidden tire damage due to an unexpected pothole could also cause an accident further down the road. Weakened tires blow out when you least expect it! 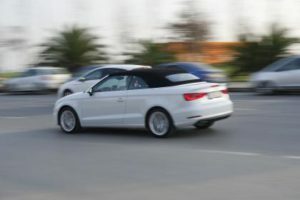 An interesting side note — self-driving car engineers are still trying to figure out how to safely maneuver the pothole! It’s an engineering nightmare, apparently. Pothole.info tells the story on its site, dedicated to pothole information and safety issues. The Pothole Patrol is a division of Missouri DOT dedicated to making it easy for YOU to report pothole locations. You can reach them by email or mobile device. Be sure to bookmark the link provided. Many Americans end up paying out of pocket for their estimated $300- $1,000 a year due to car repairs caused by potholes. Will your auto insurance cover these claims? What about your local municipality? The local Fox2Now news reports that you may file a claim with MoDOT, but there is no guarantee that you will get a payment. This is where things get really dicey! If you’re not armed with the proper knowledge, you may end up paying more than you should for a car accident caused by a pothole. You need the experienced advice of an expert personal injury and traffic accident lawyer today! Attorney Nathan A. Steimel is a long-time resident of the St. Louis area. Local traffic law is one of his specialties. Especially if you’ve been injured in a car accident due to poor road maintenance — call 636-244-3737 for a free initial consultation. Semi-truck accident victim? Find help here! Cleaning up after a semi-truck accident is not fun. Big rig — big destruction! Big gratitude, also, goes to the first responders who see the mangled messes and provide life-saving care. Firefighters, EMS crews, police officers, and ER medical staff, our hats are off to you. Not all of us can stomach this line of work. The Insurance Institute for Highway Safety (www.iihs.org) regularly analyzes large truck accident data from the US Department of Transportation. Here’s what’s surprising! Although our technology has improved, the death rates from semi-truck accidents do not show a huge improvement over the past 40 years! Unfortunately, the fatalities are usually the occupants of the passenger vehicle. Weight is a major reason. Semi-trucks typically carry loads up to 80,000 pounds. The sheer size and weight of a loaded tractor-trailer means braking takes 20 to 30% longer than a passenger vehicle. Bad weather? Slippery pavement? Busy highways? All of these factors drive those semi-truck accident rates higher. Does anyone here feel that it is safe to drive 11 hours at one stretch? Did you know the federal hours-of service regulations allow drivers of large trucks to do this? Maybe it is time for a change! Sadly, sleep-deprived driving is not uncommon. Just like folks push the speed limit, tractor-trailer drivers push and stretch the limits of their driving hours. As a result, fatality rates soar. Fatalities are not the only damage from a tractor-trailer crash. 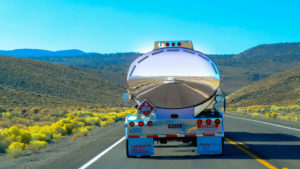 Multiple injuries, many of them serious, are also common with semi-truck accidents. Also, the devastation continues long after a semi-truck accident occurs. A December 2017 article in the St. Louis news reports a terrible recent accident. The semi-truck driver was momentarily distracted by reaching for a cup of tea and plowed into a car. This crash caused a chain reaction injuring ten people. Three of these injuries were serious! Think of the ripple effect of even one tractor trailer crash. Families, friends, and employers/employees scramble to help the injured. As a result, plans are put on hold. Everything starts revolving around doctor’s visits, therapy, and rehab. Recovery is often long, slow, and discouraging. Because of this, financial stress piles up. Money worries and pain are a toxic combination. Since an accident victim may be unable to work, finding a way to pay those bills is an overwhelming challenge. Survivors of semi-truck accident may never have a normal life again. Severe neck and spine injuries often result from these accidents. Can you imagine the life-long impact? To be fair, not every semi-truck accident is the truck driver’s fault. It’s just that often multiple cars are involved. In January 2018, FOX2 Now reports that a car cut off a semi-truck during the busy morning commute on I-64 east near St. Louis. The truck driver simply couldn’t stop in time. Multiple cars, a fatality, and multiple injuries — it’s a story no one ever wants to face personally. If you are a St. Louis area resident and a victim of a semi-truck accident, you need expert, aggressive legal help. You need an experienced semi-truck accident attorney! The Law Offices of Nathan A. Steimel, LLC will evaluate your case at no charge. Even better news — most semi-truck accident victims will pay no legal expenses out of pocket. Your lawyer will be compensated only if the case settles in your favor. CALL 636-244-3736 for help today! Did you know Missouri drivers are considered at high risk for a deer-related car accident? Car accidents are a major stress point. So watch out for those pesky deer! 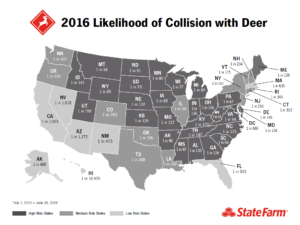 According to insurance data and claims forms analyzed by State Farm auto insurance, 1 in 117 Missouri drivers in 2016 were involved in a deer-related car accident. Fox2 Now also reported in December of 2017 that Missouri is in the “high-risk” category for deer-related car accidents. Fall and winter are the worst seasons for this type of auto accident. It pays to be alert. Deer just can’t read those “deer crossing” signs! They don’t warn you of their presence, either. They are silent and swift but none too smart, apparently. Unfortunately, the size of the beast causes a lot of body damage to a vehicle. According to one auto insurance site, the average cost of deer-related car accident damage is about $4,000. Thankfully, these accidents cause very few deaths. Just stress, stress, and more stress! When you’re tired and on your way home from work, put yourself on high alert. Dusk is just the time when the deer love to come out to feed. If your drive takes you past woods, farms, and fields, chances are even greater of a deer encounter! Deer are social beings. Expect that when one deer appears, their family and friends are not far behind. I’ve counted at least eight deer leaping across the road in front of me in one incident. Fortunately, I’d been warned to expect a crowd! Even better, I’d seen the leader of the pack in time to actually safely brake. 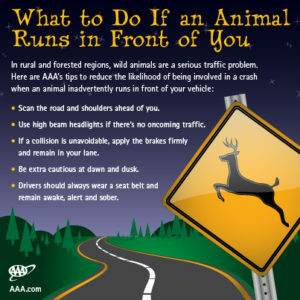 The American Automobile Association (AAA) says you should not swerve to avoid hitting a deer. That’s the natural reaction for most folks. Instead, use your brakes! Swerving creates huge problems, especially if there is oncoming traffic. A deer-related car accident that involves a second vehicle becomes much more complicated. What happens if you don’t see a deer in time? Document your accident. If you think you have any insurance coverage, make sure you call the police. Take photos. Note the time, date, and place of the accident. Don’t approach an injured deer. You could put yourself in harm’s way. Again, this is the time for a phone call. Police will dispatch someone to put the creature out of its misery. If another vehicle was harmed due to your deer-related car accident, you absolutely must call the police. Again, document everything you can. Take plenty of pictures. Take a deep breath and do a self-check. Any potential injuries? Did you hit your head? You may discover that you have whiplash symptoms hours later. This is another reason to document your accident for insurance purposes. Don’t drive your vehicle unless you are totally certain that it is safe to drive. Call your car insurance company if you plan to make a claim. IF you need to call your car insurance company, you may also need the services of a car accident attorney. Why should you even consider calling a car accident lawyer? Your car insurance company will seek to settle for the lowest acceptable pay-out. You may discover you have long-term chronic pain in your neck or back as a result of your car accident. Sadly, chronic pain makes working a challenge and may even lead to job loss. According to the Missouri Department of Transportation statistics, aggressive drivers top the list for causing serious injuries and fatalities in the state. That means aggressive drivers caused 400 more deaths between 2013 and 2015 than drivers under the influence of alcohol and drugs. Anyone here ever had to suddenly change lanes or pull off to the shoulder to avoid being hit by a “NASCAR” driver? Even if you managed to avoid a car accident, you still experience the trauma. Shortness of breath. Heart pounding. Hands shaking! You’re not alone. MoDOT’s top category for serious car accident injuries is sadly named “run-off-road” crashes. This type of accident caused almost 6,000 serious injuries and over 1,000 fatalities from 2013 to 2015. The problem with a “run-off-road” crash is that many times the aggressive driver is nowhere to be found. It’s terrible to witness a bad car accident, and not be able to identify the culprit. This happened to me once. Out of the corner of my eye in my rear view mirror, I saw an 18 wheeler going at least 60mph suddenly change lanes in front of an SUV. I was stopped in the far left turn lane. The SUV swerved to avoid the truck . It flipped across the intersection in front of me onto the opposite side of the highway. Thankfully the opposing traffic was stopped at a red light. The SUV was totaled. The 18 wheeler was long gone. Perhaps the truck driver never even knew he caused a terrible accident in his haste and carelessness. I could only say it was a white truck. Not much evidence to go on, for sure! I could only hope the driver didn’t sustain serious long-term injuries. If you’ve been in a serious car accident caused by an aggressive driver, please read on! Don’t just let your insurance company settle for you. Even the Department of Motor Vehicles admits on their website that the auto insurance adjuster is going to offer you a low settlement fee. It’s their job. They have to watch out for the bottom line of the company they work for — even if it is car insurance you paid for. Worse than a low settlement fee, your insurance company may try to claim your car accident was partially your fault. If you’ve been the victim of a “run-off-road crash”, this scenario is even more likely. Let’s hope you have a good, solid witness to your car crash. Aggressive drivers are often hard to catch! Did you know that a car accident attorney will often take your personal injury case on a contingency fee basis? This means the lawyer only gets paid if he wins your case. Then he gets a percentage of the settlement. You owe it to yourself and your family to get the best possible legal outcome if your auto accident was caused by an aggressive driver. The Law Offices of Nathan A. Steimel, LLC has a top rating as car accident attorneys by AVVO. Don’t hassle with the insurance company! Get expert legal help instead. Call 636-244-3737 today for a free initial consultation. No one likes coming in last. But according to the 2017 report from the National Safety Council, Missouri ranked last in the nation for preventable accidents and deaths. Safety issues should be a top 2018 goal for Missouri residents. A deadly late October 2017 rollover car crash in Saint Charles County illustrates this point. Neither the driver nor his passenger were wearing their seat belts. Both were ejected from the car and died as a result. Tragically, both young men were in their early twenties with their whole lives ahead of them. We’d like to hold our children’s hands forever and keep them safe into adulthood. But that’s not our job! Often, the most powerful way we can influence them is by example. Fiercely-independent minded Missourians, here are some ways you can help improve the road safety statistics during this busy holiday season. 1. We’ve said it before. Buckle up! There’s no reason we cannot set the example in this area, whether you are a parent or not. Insist that your passengers wear seat belts. Recently I pulled over when I realized a young passenger of mine was still struggling to put on his seat belt. We stopped until the problem was resolved. End of story. No one rides in my vehicle without buckling up. 2. Put down the phone, especially in work zones. These zones can sneak up on you quickly. It’s so easy to blink and miss a sign for upcoming road construction, especially if you’re chatting on the phone. In many states it is illegal to use a hand-held phone while driving. Just last week, we witnessed a driver illegally cut over a lane in front of a police officer because he was distractedly talking on his cell. Bad move! We saw him get busted. Kinda cheered. Just saying. Cell phones and driving — it’s a trend that’s here to stay. Hands-free chatting is cheap, easy, and much safer. Just do it already! 3. Use your manners when you drive. Let’s take a quick quiz! How mannerly are you on the road? Do you always, sometimes, or never do the following? a. Use your blinker when turning. b. Yield when merging into traffic. c. Keep at least a car-length between you and the car in front of you while driving. d. Allow for a car-length distance when changing lanes in front of a slower vehicle. If you answered ALWAYS to this short list, your momma would be proud of you! You’re probably a model Missouri driver. Keep up the good work. 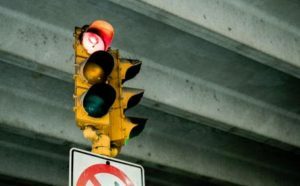 If you fall into the “sometimes” or “never” category, chances are you may have a few moving violation tickets under your belt. The state of Missouri is unhappy with you — they have a reputation to improve. Are you at risk for losing your license? Even failure to use your signal properly can mean two points on your license in Missouri. Those small moving violations, like credit card debt, add up quickly! The Law Offices of Nathan A. Steimel, LLC offers experienced, aggressive legal help for folks with moving traffic violations — even if you had a bad day and forgot your traffic manners. Call 636-244-3737 for a free case evaluation today from an experienced Missouri traffic attorney. 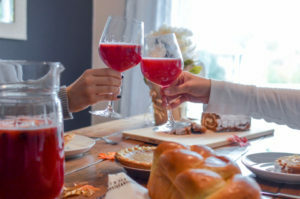 5 tips to avoid becoming a 2017 DUI holiday statistic! This does not include the bloodshed, pain, tears, and lives forever changed due to drunk-driving injuries. Those stories often go untold. The truth is this: drinking and driving just don’t mix! The AAA predicts that 2017 will be the busiest Thanksgiving travel season since 2005. Busier highways and more congestion equals more travel risk, right? 1.) Gonna kick back and enjoy that beer, Grandpa’s “secret recipe”, or a glass of fine wine? You know the drill. Don’t leave home without a designated driver. If you get stopped while your blood alcohol content is over the legal limit in Missouri (.04 BAC), you’re facing a license suspension or much, much worse! Consider the holiday mood of the police officer and the judge! They’ve seen too many alcohol-related deaths and injuries. Their view of you is likely to be very dim — don’t expect leniency! After all, the 2016 drunk driving statistics are grim. 2.) Sadly, the next highest 2016 NHTSA fatality statistic is due to not wearing seatbelts. Please BUCKLE up for highway safety. Seatbelts are one of your lines of car accident defense. You can count on sharing the road with people driving under the influence of alcohol, drugs, or both! Be sure to spy on your kids while traveling. They have a way of sneaking out of seat-belts when you least expect it. 3.) Allow extra travel time. According to the 2017 AAA holiday travel predictions, getting places around congested cities could easily take THREE times as long as normal. That lovely half hour trip across St. Louis to visit your in-laws? Think about highway congestion and weigh your options. What are the normal hotspots for traffic back-ups? Having an alternate travel plan could be safer and healthier for your blood pressure. 4.) Have a roadside assistance plan in place. If you have any sort of auto-related accident, you’ll be happy you had your roadside assistance current and up-to-date. Adding their number to your contacts in your cell-phone is one great way to make sure you don’t leave home without it! 5.) Avoid drunk drivers by not driving late at night. The National Safety Council’s research shows that the risk of a fatal crash is three times greater at night, and that 50% of traffic fatalities occur after dark! Add late night gatherings with family and friends to this mix. Alcohol and fatigue are a deadly driving combination. If you are involved in a car accident over the holiday weekend, don’t wait to call your car accident lawyer. For an experienced traffic accident attorney serving the greater St. Louis area, call The Law Offices of Nathan A. Steimel, LLC at 636-244-3737. HINT: put this number in your contacts’ list, too. Better safe than sorry! Attorney Steimel will give you a FREE initial consultaton. Now that’s something to be grateful for! Thanksgiving and holiday travels are just around the corner. Frenzied or distracted driving — a major factor in car crashes — could change your life forever! For many women, the coming holidays make that “to-do list” miles longer! If you’re also a “taxi-mom”, you’re likely to have a higher risk factor for distracted driving. 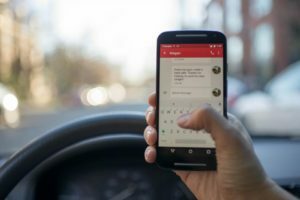 According to the Missouri State Highway Patrol, distracted driving is a leading cause of deadly traffic accidents in the state of Missouri. Nationally, more than a quarter of a million people were injured in distracted driving traffic accidents in 2015. Also in 2015 — there were 3,477 motor vehicle fatalities due to distracted drivers, according to the National Highway Transportation Safety Administration. Even 5 seconds of texting at 55 mph can forever change your life! These scary statistics sadly don’t seem to matter when our daily lives start rolling along at high speed. So many places to go and people to see! Nothing will ruin your holiday season quicker than to be responsible for the death or even serious injury of a friend or loved one! Intentional safe driving takes planning and education, too. Turn your cell sound off or on vibrate before starting to drive. Unless you are in the middle of a family emergency, almost any phone call can wait until you are able to pull over. Plan B: if possible, use your children or other fellow passengers as a cell-phone answering service. I love it when I see texts from my mom friends that are obviously written by their kids. Misspellings? No punctuation? That’s okay! These make me smile because I know my friend is practicing safe driving techniques! Long drive ahead? Plan for cell phone pit stops. Consider it a reward for good cell behavior! That’s right. Just go ahead and schedule time to pull over and check your phone for a few seconds. If you have a worried loved one, they will be happy to know you will be checking your phone every so often! Hands-free options? Many modern cars are equipped with bluetooth or other hands-free cell phone technology. Resist temptation to check all social media updates while driving, too. Turn off notifications if the urge is too strong. Your friend’s latest Instagram post of tantalizing holiday baking is just not worth that possibly fatal second of distraction. Sadly, our social media addiction sometimes kills. Keep your eyes wide open for other distracted drivers! Especially watch for merge areas such as exit and on-ramps. Living in the urban sprawl, we regularly encounter the driver that merges wildly and dangerously into traffic. We do the cell phone check! More often than not, the dangerous driver is on their cell at that moment. Busy, amazing, multi-tasking ladies — you’ve got this! You can drive to survive and enjoy this holiday season. Know someone who needs legal help due to being injured in a distracted driver car accident? The experienced car crash attorneys at The Law Offices of Nathan A. Steimel, LLC offer a free initial consultation. Don’t try to settle without expert legal help from an experienced car accident attorney! Call 636-244-3737 today! It was all my fault — my first car accident. No police reports were filed. No ticket was given. I swerved and overcompensated my steering on a narrow, shoulderless road, and ended up hitting the embankment on the opposite side of the road. A few hours later, my brother was lying in bed alternating ice and heat on his very sore neck and shoulders. His whiplash was apparently much worse than mine. I felt terrible! Whiplash is one of the most common car accident injuries, even for a low-impact car accident. It is an unwelcome guest that often shows up after the initial car accident. Very commonly, rear-end collisions are to blame. However, side-impact and head-on collisions are definitely also culprits. Sports accidents, getting hit in the head, slip-and-fall accidents — all of these can result in a rapid whipping motion of our super flexible cervical spine! Neck and shoulder pain after a car accident are sometimes the first signs of a whiplash injury. However the list of possible symptoms is quite long. Since whiplash injuries are so common, many insurance companies will investigate any claims for fraud. You need to have your ducks in a row when making a car accident whiplash claim! Seek medical attention promptly when you feel the onset of symptoms. Don’t wait to see if you symptoms will just vanish. Make a list of your symptoms before your doctor’s visits. Sticky note, journal, list on the phone — use whatever works for you! The thing is, you don’t want to forget a symptom while discussing your needs with your doctor. Not only will this improve your medical treatment, you will also need this documentation for your whiplash insurance claim. Document your doctor’s visits. Ask for copies of the records of each visit. More doctors’ offices are going completely digital, but they will still print out a report of your visit per your request. 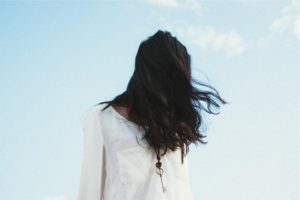 If your neck is being a pain, and you can’t think clearly on the muscle relaxers you were prescribed, you’ll be glad you have a paper copy of the visit to help you with the next step you need to take. You may think calling your insurance claims office is enough. However, if your whiplash turns out to be a sign of a greater spinal injury, you need a lawyer who will be on your side. You need unbiased legal help. After all, any insurance company is naturally trying to minimize their own cost for your car crash. 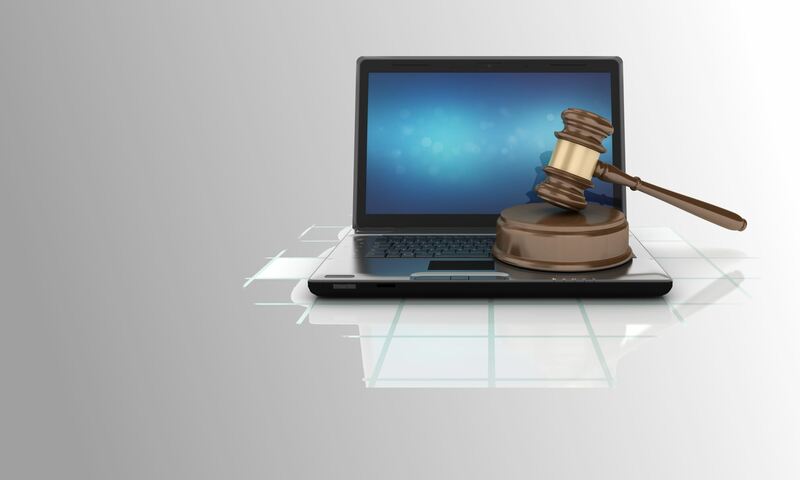 Your car accident lawyer will speak directly with your insurance company, but your personal records will also be an important part of the process. Stand up for yourself! Get medical help and a caring, experienced personal injury lawyer. Call 636-244-3737 for a free initial consultation today. According to the Centers for Disease Control, more than 121,350 children ages 12 and under were injured and 602 chldren died in car accidents in 2014! Statistics like these are why September 17-23, 2017 is National Child Passenger Safety Week. This hits close to home for anyone who loves and cares for children. In fact, car seat and seatbelt use saved the lives of both of my friend’s neices a few years ago. Sadly, this horrific accident claimed the lives of three adults in the same vehicle. A fifteen passenger van collided with a semi-truck on a high speed highway years ago wiping out almost the entire vanload of passengers. A tiny survivor was found still strapped into his car seat in the middle of the highway, basically uninjured. You may have a similar story to tell. No doubt, child safety seats and seatbelts save lives! Parents and caregivers, you can help protect our most precious natural resource — your children — whenever they travel in a vehicle. 1.) Choose the right safety seat. This sounds like a no-brainer. 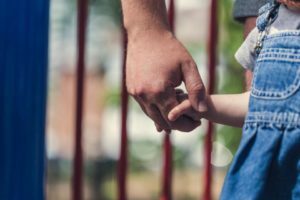 But, if you are a busy parent or childcare provider with multiple children, this step might fall through the cracks. There are basically four types of car seats/restraints suitable for children — rear facing, forward facing, booster, and seat belt. The appropriate type of child safety restraint changes with size and age. Sometimes budget constraints cause us to “make do” with what we have on hand. A car seat’s buckles and straps get worn out by multiple users, limiting their effectiveness in an auto accident. The National Highway Traffic Safety Advisory (NHTSA) advises against reusing a car seat that has been in a moderate to severe car accident. Did you know that you can get your car seat inspected for safety and correct installation for free? 3.) Buckle up that tween in the back seat away from airbags. This may be the most difficult step to follow! Gulp. We wear seat belts in our family. Period. That’s a non-negotiable. It’s also the law. Riding in the car’s front passenger seat, however, is another battle for a coveted spot! It’s common knowledge that many car accidents damage the front of the car. So, the back seat is usually safer for children ages 12 and under. Why? That’s the question your tween will ask. Ha! Here’s your bullet-proof answer. Airbags deploy at approximately 200 mph. Imagine the damage this could inflict to anyone, let alone a child! If you parent a tween, you will have to decide if this is a risk worth fighting for. According to the Department of Motor Vehicles for the state of Missouri, children under 16 must wear a seat belt. Unfortunately, this does not apply to school buses or public carriers for hire. We have safety issues that still need to be addressed! National Child Passenger Safety Week is just a friendly reminder to help you protect your most valuable treasures — your children. If you or your child are injured in an auto accident due to another’s negligence, you need a car accident lawyer to fight for the compensation you deserve! A good car accident attorney will help you handle the insurance company as well as expertly represent you in court. You will need money to cover injuries, damages, loss of work, and the many hidden costs of a car crash. Do not settle with your insurance company without first contacting an experienced car crash attorney! The Law Offices of Nathan A. Steimel, LLC believes in fighting aggressively for your rights. Call to schedule your free evaluation at 636-244-3737 today! Drive to survive — don’t let an auto accident eclipse your weekend plans! St. Louis and the surrounding areas are preparing a PARTY to celebrate the first total eclipse viewing in our region since 1442! This predates Columbus. The excitement is building! With 1.6 million residents in the St. Louis area alone, this is going to be one massive celebration when you consider the guest list. EVERYBODY and their uncle is invited. Not only that, the party stretches over multiple counties and towns. Visitors and locals alike have an amazing array of events to choose from. People are going to go places. Crowded streets and highways are a sure bet! Tempers flare. Then we have trouble. Car accidents and injuries are also a sure bet in crowded conditions. Area hospitals and emergency centers have been laying in extra supplies. Public service workers, officers, and emergency management teams are prepping as well. No one wants trouble. While you can’t control those around you on the crowded roads, you can also certainly take precautions. If you plan to be out and about this coming weekend, here are some common sense ways to prep. C’mon! You KNOW you want to enjoy the fun! 1.) Avoid the main roads if possible. It’s okay. Take the scenic route. You may get there faster, anyways! Being a local, you have the edge. You probably know the back roads and multiple ways to get to where you want to go. So plan that extra time and spare yourself some headache. 2.) If you’re going somewhere unfamiliar, map out your adventure! Guess what? With so many people converging on an already crowded area, some states are expecting cell towers to be overloaded. You may have trouble with your GPS! Plan ahead and bring a paper map. If you can’t find one (age of dinosaurs, he, he), print out your directions from an online mapping service. Besides learning about astronomy with your family in living technicolor, you can take them back to the days of Columbus! Teach them how to read a map. Map out multiple routes, and don’t forget to plan your way home! 3.) Pack your own emergency supplies! Add to it! Extra water, extra food, road flares, and first aid supplies — you can’t go wrong. If you don’t need it, you may be a friend in need is a friend indeed to someone else. 4.) Don’t forget about prepping your car! Got a full tank of gas, oil, and coolant? A quick peek under the hood before you leave could make big difference in your day. Your family will love you more if you don’t run out of gas! Walk around and check the tires. AAA will rescue you, but you might be in a long line for the tow truck, too! 5. ) Plan to keep your cool. Crowds are more stressful for some of us than for others, true? If you find yourself in a fender-bender or a minor car accident, take a deep breath. 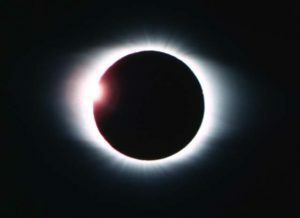 You may not be able to watch the eclipse from your top choice of viewing locations, but it will still happen! No one stops an eclipse. Take another deep breath. Wherever you are, check your watch and gaze in awe at the skies. You can munch on some of those extra snacks while you wait. It’s a once-in-a-lifetime moment. Make sure you don’t miss it! If you’re traveling in the St. Louis, Missouri area, you need your best St. Louis attorney in your phone contact list as an added emergency safeguard. Better safe than sorry!